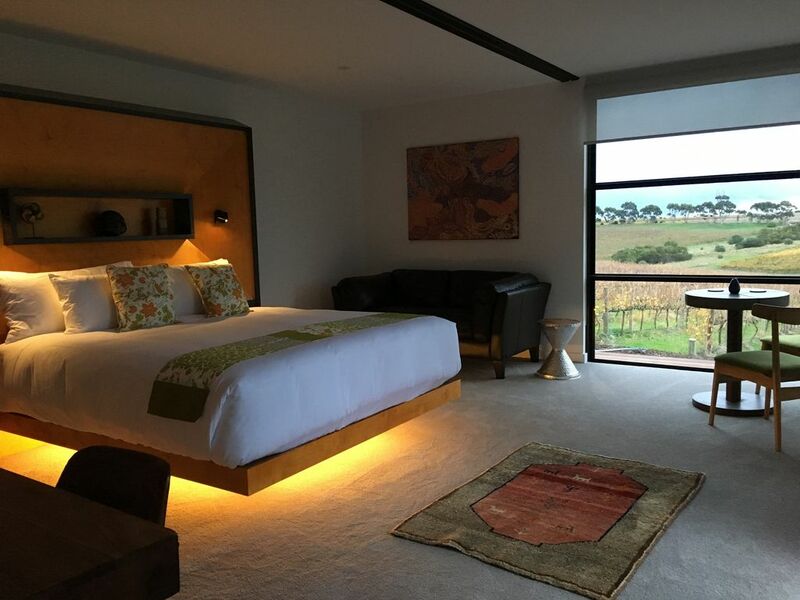 The luxury micro Hotel California Road is your perfect adult escape to McLaren Vale. Set in the vineyards on a private floor, each 50 square metre king suite boasts a huge deck, soaking tub with floor to ceiling windows overlooking the vines, luxurious floating king bed, dual vanities and rain showers, mini-bar stocked with Inkwell wine and snacks, leather couch, Dolce Gusto coffee, 50"HDTV with Yamaha wi-fi and bluetooth enabled sound bar all lit with amazing light fixtures. Rooms also have ample USB charging / power points, a desk and small table with chairs. There is also an outdoor common courtyard and deck for hotel guests for watching vineyard sunsets around a fire bowl. Australian continental breakfast provided. Open seven days a week. Special rates available for two night minimum: weekdays $225 per night, (both) Friday and Saturday $300 per night. No kitchen or cooking facilities. Maximum occupancy in each room is two people. No pets. No smoking. Irina and Dudley are the owners (and winemakers) of Inkwell Wines and the Hotel California Road. We live in a house on the property and manage the day to day operations. The property at Inkwell is set with spectacular views of the Sellicks Range and peekaboo views of the Gulf of St. Vincent. The Hotel California Road is set in the middle of the vineyards on the property. Each suite is ultra-private. The building is built from 20 recycled shipping containers and finished at a luxurious standard. Both of us have traveled to wine regions all over the world and been very involved in the sustainability movement in vineyards. We wanted to offer a property that built on that ethos and met the standards of luxurious accommodation as well. Set in the vineyards of Inkwell Wines in McLaren Vale. There is an outdoor dining table with views fr those who wish to take their continental breakfast outside. Television and audio system are wifi and bluetooth enabled so guests can stream content. Yamaha sound bar - wifi and bluetooth. In addition to private decks, there is a communal deck in our vineyard view courtyard. One suite is built to be configured with a dedicated wheelchair access bathroom or with a luxury bathroom as in other suites. Beautiful location, with excellent accommodation. Great location to explore the local area. Everything was clean and well presented, beautiful bathroom all very high quality. The only criticism was the very boring breakfast that was supplied and the fact that you had to go and use a communal toaster to toast your sliced bread. The facilities were amazing and every little detail has been thought of with nothing else required. The property is situated on an amazing vineyard with spectacular views at sunset and the most luxurious bed and bathroom. The owners are very friendly and helpful and we would recommend this holiday destination to anyone after a romantic, relaxing and luxurious get away and their wines are also excellent.